Ever have a status quo day? You know the kind, where everything is repeated from the day before. Same wake-up time, same morning meal, same work tasks to complete during the day. Leave work. Pick up kids. Make dinner. Bedtime. While there is comfortable familiarity in the repetition, the monotony might eat you alive. Each of us has the ability to live an exclamatory life. It’s a choice I make each day and you can, too! We simply need to look for opportunities to shine, to make a difference, to share our kindness with others. Living an exclamatory life has no boundaries. Introverted, Extroverted, personality doesn’t matter – YOU have the ability to overcome the dreariness of the day by making a choice to be amazing. I live an exclamatory life! It’s true! I speak in heightened syllabic parameter (which, quite possibly may not even be a real phrase, but it feels right.) I am excited about EVERYTHING! I even end many of my sentences with an overused exclamation point! See? While your level of engagement may not be as vocal as mine, you are not chained to live a dull, status-quo life. 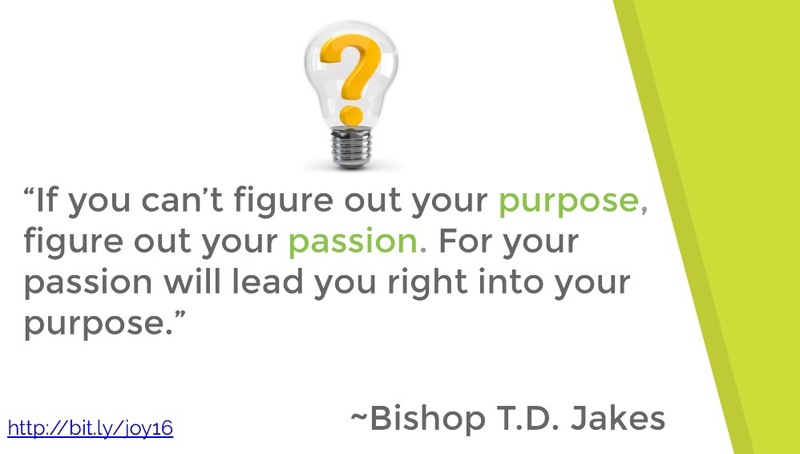 You have purpose for greatness! Yesterday I had an after-school training scheduled with a teacher at a nearby school in my district. The date has been on the calendar for weeks and I arrived with extra time to spare. As I was gathering my materials from my car, I noticed two men walking towards me, trying to get my attention. I looked beyond them and saw a stationary pick-up truck, doors open and hood lifted. While they appeared to be in genuine need of assistance, I was tempted by the responses that so easily filled my head. I don’t want to be late for my training. I shouldn’t help strange men I don’t know. I don’t have jumper cables. The status quo me could have easily turned away and gone about my business, bustling along with the same agenda I had set, no thought for anyone else but myself. After all, that would have been much easier than the inconvenience of an unexpected delay. There was only one problem with that logic. I am not a status-quo person. I am exclamatory! I smiled at the two men and said I would help. I moved my car closer to their truck where jumper cables sat idle, waiting for the kindness of a Good Samaritan. It didn’t take long to get their truck rumbling again. One of the gentlemen noticed I had a loose bolt and offered to tighten it for me. Ahhhh… the rewards of being in the right place, at the right time. A random act of kindness win-win. We thanked each other with smiles and appreciation then parted ways. I entered the school building and walked towards the teacher’s classroom for the scheduled training. The training had been cancelled. I didn’t even need to be there. Sometimes we go about our daily duties and never notice the importance of those little whispers on our heart. What if I hadn’t left early? What if someone had told me the training was cancelled? What if I led a life of fear? What if I simply didn’t care? Would the two men have found someone else to jump-start their truck. Probably. Who am I to think my little random act of kindness really makes a difference in anyone’s life? Surely someone else will help, right? Stop doubting your impact on others. Live an exclamatory life! Look for the good in the world. Open your eyes and see how your words, actions, even your smile, can transform someone else’s day. While the act of kindness you share with another may seem like “no big deal” to you, it could very well be the one thing that transforms someone else’s day from status-quo to exclamatory! And, if you happen to see this truck driving around town, give them a nod or a kind word. They deserve an extra shot of kindness – and you do, too! Today wraps up our last day of Jeff Goins’ 7-Day Blogging Challenge. He deemed today a day of rest (very appropriate for a Sunday!) and shared his analogy of training for a marathon: while the entire race is long, the occasional sprints build endurance and make you stronger. Yes, this pretty much summarizes my week. Like many writers, this is not my full-time job. I’m an instructional technologist working in a public school system, providing professional development for teachers who want to integrate technology in their lessons. Much of my day is spent either in the classroom teaching students or preparing resources and training materials to support the needs of teachers and district administrators. I do my fair share of technology troubleshooting as well. When the final bell of the school day rings, my job is still not complete. I offer training sessions after school and attend various meetings. Sometimes I tutor students or participate in webinars to enhance my own professional growth. Several nights a week I bring work home, waiting for my three children to go to bed so I can continue the unfinished work of the day. Finding time to write is an ongoing quandary in my world. Now let’s throw in a 7-Day Blogging Challenge to the mix. It’s one thing to carve out time to write. It’s quite another to write and learn. I did it because I needed to grow. See, that’s the beauty of a 7-Day Blogging Challenge. It’s a choice. I wanted to learn new things. I wanted to become better at my craft of writing. I wanted to know what I didn’t know and figure out how to move from static to dynamic. I prayed for a push and received an invitation instead. 1. It’s OK to not know what you are doing. When I began this blogging challenge, I had no idea what the journey would entail. I didn’t receive a syllabus, nor an agenda for weekly assignments. Each day began with a new post from Jeff with a task to complete, most often on a platform I never knew existed. I was constantly faced with my lack of knowledge in marketing, advertising and social media management and often felt incompetent, even in the area of technology which I use every day! Learning something new, no matter the content, humbles you quickly. HTML codes. Widgets. Plug-ins. Pixels. No matter how many times I tried to follow the directions shown on my screen, I was met with a product that didn’t match my vision. Again. And again. And again. And then it worked. The pop-up appeared, I could close it out, and all was well with the world. (In my mind, the heavens parted and I could hear a choir of angels singing the Hallelujah chorus in perfect harmony.) No one watched me struggle. No one witnessed my frustration. I could have easily given up and no one would be the wiser, especially with the pressure of a daily deadline. But I persisted and, in the end, was met with success. 3. Everyone has a purpose for their writing. With almost 3,000 people participating in this challenge, it’s easy to get lost in the shuffle. As each person posted links to their blog posts, manifestos, giveaways, and more, I found myself caught in the comparison game, my inadequacies as a professional writer glaring back at me with each paragraph I read. Then something amazing happened. About mid-week I stopped comparing my writing with others and started seeking out the writer’s purpose. Why was the writer sharing this story? What lessons were to be learned? How does this writing appeal to me as a reader? What could this writing teach me? It helped redefine my purpose for writing and move past the fear to write and share more. 4. Random acts of kindness are everywhere. You wouldn’t expect a virtual blogging group to bring out the good in others, but that’s exactly what happened. Jeff’s Day 2 Challenge encouraged us to share something as a lead magnet; Day 5 was to give away something for free. Day 6 was to ask for kindness from someone else in sharing our writing with others. Bloggers I had never met were taking time to read my writing, offer suggestions, share ideas, even troubleshoot my questions. Their kindness encouraged me to keep writing and inspired me to think creatively about blessing others in this realm of writing. The greatest random acts of kindness shared this week were from Jeff Goins himself. He willingly organized this challenge, shared insights from lessons learned, and encouraged us along the way. From live video broadcasts with back-channeled questions (nice hair and nice grill!) to scheduled check-ins to gauge our comfort level, he made this journey of learning not only productive, but enjoyable. I am thankful for the opportunity I’ve had this week to sprint as fast as I could to the finish. Now is the time to catch my breath, retie my laces, and start again. Writing really is like a marathon and I’m in it for the long haul. Runner, spectator, or cheerleader, we each have a purpose for the journey. Won’t you join me in the race? For Day 6 of Jeff Goins’ 7-Day Blogging Challenge, we were encouraged to reach out and ASK. Ask someone to share a blog post. Ask for some feedback. Put ourselves out there and just ask for help. I feel like I’ve already done that so many times with you already – YOU are the reason I’ve had more than 30,000 views on my blog to date! When I created my public Facebook page just a week or so ago, I took a chance and asked you to “like” my new page. I hate asking people for help. But I did. I knew I needed to brand myself professionally on several platforms and you responded in a BIG way! Today I hit 200 “likes” on my Facebook page – WOW! While this may not seem like an accomplishment for others, this is HUGE for me! Thank you for your support and encouragement as I continue to chase my dreams of becoming a published writer. I appreciate each and every one of you! Now on to the celebration… to wrap up the free giveaway challenge of Day 5, I had a drawing for someone to receive a free random act of kindness performed in their honor. Click here to see who won! Being kind is FUN! I can’t wait to see what the upcoming week has in store. Join me in my mission of putting more JOY into the world around us! When was the last time you gave money to a complete stranger? Did you toss a few coins in an open guitar case as you strolled by a musician on the street, head down so you didn’t have to make eye contact? Perhaps you donated money to a non-profit organization, your generosity marked by the CVC code on the back of your credit card or the signature placed at the bottom of your check. Maybe I should have been more specific with my question. When was the last time you handed money to a complete stranger? Ahhh… now the stakes have changed. Just this week a friend of mine posted a story of how he handed $60 to a Dunkin’ Donuts employee with the challenge of paying for the purchases of as many people as possible behind him in the drive-through line. As other people commented on his post, I was shocked to see just how many people viewed the action through the negative lens of cynicism. Even the unspoken words echoed sentiments I had heard before. Really? That’s your reaction to kindness? Who cares what the girl did with the money? Sure, in an ideal world, she would do as the giver requested and use it to pay-it-forward, but what if she didn’t? Would the world end? Would the random act of kindness be any less meaningful? Let’s take a moment and play out the scenario. The girl kept the money for herself. Maybe she had to purchase books for next semester’s college classes. Maybe she needed to put gas in her car so she could continue to drive to work. Maybe she needed to feed herself instead of others. Maybe she went to the mall and bought a new outfit that made her feel pretty and confident. Does this mean the donation was wasted? Why must we tarnish the genuine thoughtfulness of the RAK with our own pessimistic outcomes. Who are we to judge? My response to the naysayers? See, I know something they don’t. I know the joy in giving. It doesn’t matter to me what someone does with a gift I give. Keep it, toss it, pay-it-forward, rock on. All I care about is in the moment of giving, you know someone cares about you. You are important. You are valued. You matter. That’s what kindness provides: validation of worth. And that, my friends, is priceless. As for the Dunkin’ Donuts worker who was given $60 to pay-it-forward? She did exactly that. Her manager and two other co-workers shared the story to my friend when he stopped by the next morning to see how it went. His donation not only paid for several family purchases, but others took notice and paid-it-forward, too. In the end, kindness wins. Think about all the things we celebrate in this world. Birthdays. Holidays. Marriages. Deaths. Each has their set of cultural expectations and, for the most part, we join in without question. It’s simply what we do. Yes, I know we celebrate in different ways and there are some who choose to celebrate nothing whatsoever. There are even a few who claim to celebrate everything. Wait. That might be me. It’s true. I have a tendency to turn everyday events into celebrations. Why, even today I celebrated Pi Day at school! For the most part, with the exception of the passing of a loved one, celebrations bring a spirit of joy and frivolity. There are smiling people, genuine merriment, and quite often food. Celebrations are a way to mark the passage of time, achievements now grasped, acknowledgment of worth. They bind people together with a common thread, weaving memories into a tapestry of stories to be shared with others long after the celebration has ended. My children love to pull out the dusty scrapbook albums lining my bookshelves, the plastic sheet coverings crinkling as they turn page after page. “Remember this, Mommy?” they question as their faces light up from pictures of their first birthday parties. Though they were too young to remember the moment of shoving their fists into the cake and smearing icing across their faces, they have a memory captured forever in their spirit simply because I took the time to document the celebration. Kindness is a value I’ve always held sacred. Whether it was sitting beside an outcast on a long bus ride home, or smiling at a stranger passing by, I’ve always tried to make an effort to be nice, even when there was no reward. It wasn’t until I chose to do 40 random acts of kindness for my milestone birthday did I realize that the very act of kindness itself could be a celebration. Celebrate kindness. It’s my life’s purpose, an inseparable part of my soul. I was hesitant to share my stories at first. What would be the reaction? Would I be viewed as self-serving and narcissistic? Who would take the time to read my writing? Would anyone even care? I dove into uncharted waters, praying I remembered how to swim, and dog-paddled my way to this moment, here with you today. It’s no accident that you are reading my words right now. Maybe the title of my post intrigued you or perhaps you are a faithful follower who never misses a post. Either way, I know you are bound for greatness. You are here for a reason. Whether your kindness is a small act of sharing or a monumental sacrifice for many, you have the power to change the world, one random act at a time. Never underestimate your worth. Don’t doubt the impact your actions have one someone else’s life. If you don’t tell your story, who will? I am here to prove that kindness matters. And that is worthy of celebration. Today was an amazing day! The session went well, with lots of laughter and joy scattered about (thanks to everyone who tweeted out comments on #edtechrva – you ROCK!) I loved learning more about the passions of the session participants (shown on this Padlet) then sharing the passions of our students. When the session ended, many participants stayed behind to continue the conversation and ask more questions which was great! Of COURSE, I wanted to sponsor a student! 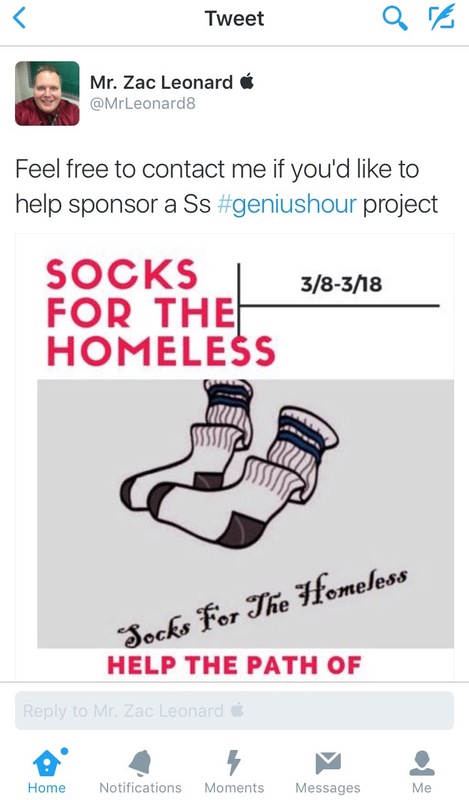 What a wonderful project that would have a direct impact on others! 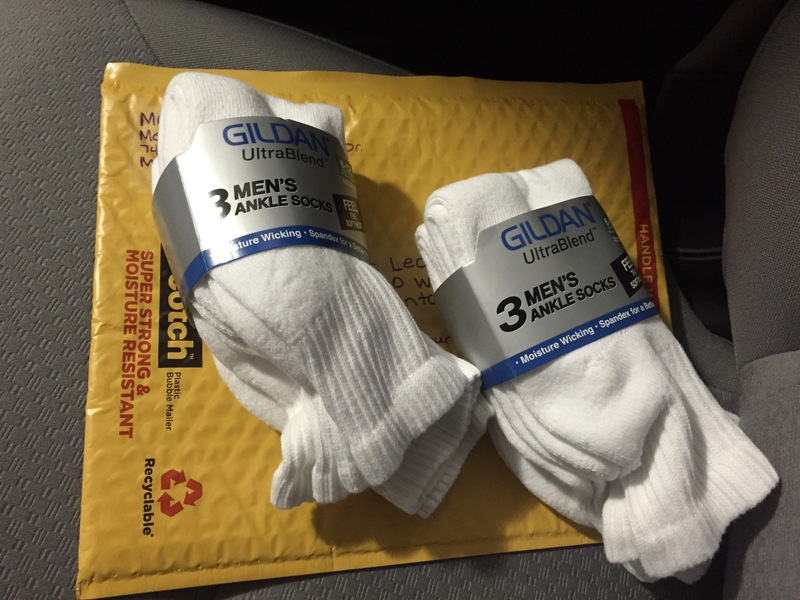 I contacted the teacher on Twitter for a mailing address, then stopped by Walmart to pick up a couple pair of socks. Today, after the conference I put passion projects into motion as I mailed off my contribution. It brings such joy to my soul to know that young people are investing their time and creativity into helping others. What a divine purpose indeed! I’m also thankful for teachers like Mr. Leonard who recognize the power and potential of embracing young students’ passions. A shout-out to all the fantastic people who helped organize and facilitate this year’s EdTech conference! Thanks to your hard work, educators such myself can learn, grow, and share the wonderful things we are doing in and out of the classroom! Kudos!